It was on the first day of spring 1995, at King’s Daughters’ Medical Center, with me holding onto his hand, that my father rose up with two gasps for breath, lay back with a sigh, and left us for awhile. My brother and my sister and I, of course, were not the first to lose a father who showed his love for his children through the labor of callused hands, pride in his eyes at our accomplishments, and with a heart big enough to share our disappointments. Let this, then, be a short tribute to every father who took the time to share life with his children, sometimes with a pat on the back, sometimes with a switch applied down lower. While growing up, I don’t remember Dad ever telling me, “I love you.” That would have been completely out of character for this 6-ft., 1-in., 235-pound railroad track laborer and foreman. But he showed his love every day. He built the fire in the wood stove so that the room was warm when I arose for school. He worked through heat waves and blizzards to keep food on the table and clothes on our backs, and to insure that our education extended beyond where his ended, with the eighth grade. Through most of my school years he lived on camp cars with the extra force crews during the week. If my big brother and I got beyond the control of our mother, she dutifully made a report with Dad when he came home for the weekend. My fondest memories of my father came from the pursuit of the fishes, the sport that consumed most of his leisure time. With patience, he taught me to thumb the line on those old Penn bait-casting reels so that I could fling the lead sinker and bait far out into the Ohio River where the big ones swam. He taught me how to set a trotline and how to skin a catfish so that its spines didn’t rip my hands. In those early days, he might set as many as a dozen poles up and down the riverbank, then sit down with a paperback Zane Grey novel and wait for the fish to come to him. 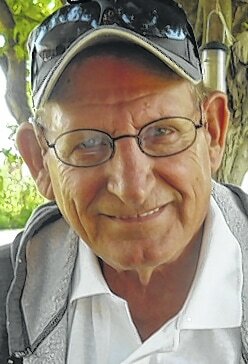 He never owned a car and might walk several miles with his gear to fish a favorite hole on Tygarts Creek. Later, after I married and left home and got into boats and bass fishing, he learned to enjoy chasing fish and fighting them on artificial lures. We fished lakes across Kentucky and Ohio, running from thunderstorms and pulling under bridges to escape summer hailstorms. After he retired with 50 years service with the C&O, he and Mom enjoyed week-long fishing trip to Canada waters with their friends, Lynn and Lou. Dad looked forward to our annual fall family fishing trips to Dale Hollow Lake, where we would rent a houseboat from Star Point Resort. At night he would sit by the rail and watch his poles and the shooting stars. He could swim (at least I think he could), but he never enjoyed leaving a boat for the water. Once, on Kinniconick Creek, he eased down the bank to get into my 12-foot boat, which we had loaded with gear – and lunch – for an all-day float trip. All of his weight on one side was too much for the little boat. He was backstroking for shore, his lower legs still hooked over the side, as the water rose to my chest. Our gear, including our lunch packed in a Styrofoam bucket with the lid pushed down tight, was floating away. Four days before he died, I sat by his hospital bed and we laughed again about that episode and others. The love my brother and sister and I shared with my father was also shared by his grandchildren. Lisa, a granddaughter who lived next door to him growing up at South Portsmouth and who helped carry the fishing gear on many a trip across the bottoms to the river, had had to leave suddenly two years before his death without saying goodbye. When Dr. John Bond advised me to call the family in, Lisa was in Montana, trying desperately to catch a jet plane fast enough to get her home in time for one last hug. And although she didn’t make it, she has those memories to sustain her – memories of a life shared with a beloved grandfather. My father knew where he was going when he left this life, and he had made adequate preparations for the journey. He did not go into the night; he went into the light. G. SAM PIATT can be reached at (606) 932-3619 or gsamwriter@twc.com.